Backsplashes began life as functional conveniences – easy-to-clean surfaces that protect kitchen walls from cooking messes. But it didn't take long for designers and homeowners to realize that a backsplash can do so much more. It's perfect for adding a splash of color or a personal touch, and can even transform a tired background to the focal point of the kitchen. 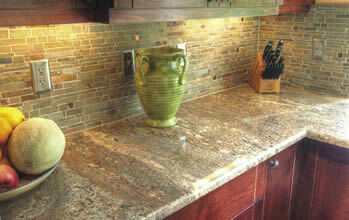 Adding a backsplash also can be a less expensive, easy way to update your kitchen. For some inspiration, feast on these nine kitchen backsplashes, from ceramic tile to glass and metal. 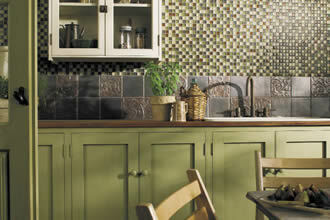 A backsplash is the perfect place to add color to your kitchen remodel. Shown here: Daltile's Glass Reflections tiles in Honey Bee capture and diffuse light, creating a sense of depth that enriches the room. The tiles are resistant to fading and discoloration, impervious to water and stains, and highly resistant to chemicals, making them ideal for backsplashes. Found locally at Curtis & Campbell and One of a Kind Design. 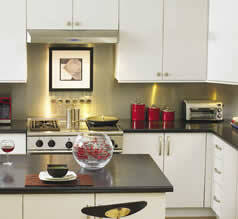 Installing metal in a kitchen lends a streamlined, contemporary feel to the space. 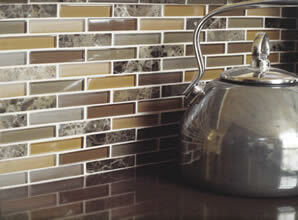 This metal laminate backsplash from Wilsonart is an inexpensive alternative to metal. Constructed much like plastic laminate, the product is covered with a metallic layer. Shown here: Decorative metal in brushed nickel. Other finishes include aluminum, stainless steel, copper and brass. Found locally at Spenard Builders Supply and Curtis & Campbell. Dating back nearly three millennia, stone mosaics decorated the tombs of Egyptian kings, the public buildings of Greece and the spas and residences of ancient Rome. The timeless allure of natural stone continues to inspire today's kitchen designers, and can be used everywhere from traditional to the most contemporary settings. Shown here: United Tile's Falling Water Slate Mosaic in Earth with custom Statements Italian Glass. Designed and installed by Trailboss Solutions. 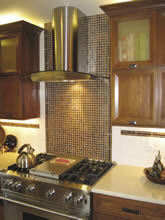 Think eco-friendly when it comes to your kitchen backsplash by choosing a sparkling, recycled-glass tile backsplash. 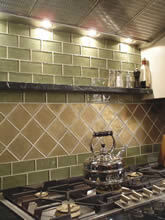 Shown here: Terra Green Ceramics' Reflections tiles in Castano Mocha Mix. Use it as an accent to create interest or to fill an entire wall. Designed and installed by Trailboss Solutions. Two kitchen backsplash materials are better than one, such as this backsplash using glass and aged bronze metal from Daltile. Found locally at Curtis & Campbell, One of a Kind Design, Carpet World of Alaska and Mat Valley Tile & Stone. 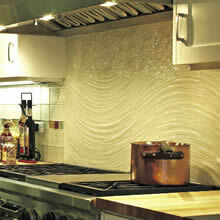 The timeless beauty of sculpted ceramic tiles are mixed with the handcrafted beauty and richness of real cast metals. 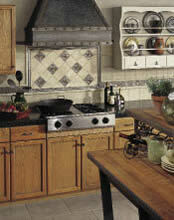 Shown here: Daltile's Village Bend in Olive with coordinating Metal Signatures Aged Iron decorative tile. A range of patterns is available, including floral motifs, vine and lattice designs, and Old World nautical maps. Found locally at Curtis & Campbell, One of a Kind Design, and Carpet World of Alaska. One of the newest backsplash trends is putting the choice high up or over the entire wall. These hand-crafted copper tiles give the kitchen a classic feel and will age to a beautiful patina. Material used: Tierra Sol in Antique Copper with Antique Copper liner/brown glass. Designed and installed by One of a Kind Design. For rich, woven designs and textures inspired by nature, think Oceanside Glasstile. These tiles offer a watery translucence that adds depth and richness to a subdued color palette. Shown here: Haiku in Cane Iridescent and Equator Non-Iridescent Casa California metallic and translucent glass tiles. Found locally at Alaska Marble & Granite, Pacific Tile and Curtis & Campbell. The palette of possibilities in glass is virtually limitless, as shown here with UltraGlas. The unique flexibility of UltraGlas enables the creation of one-of-a-kind pieces. This backsplash combines two textures: UltraSea (at top) and UltraSwirl. Available at Pacific Tile.